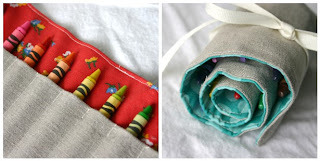 I've added a few crayon rolls to the shop. I love to give these as gifts along with a coloring book. They are a good little stocking stuffer as well. I would have to agree! I use mine every week!! I love these, the bean bags, and that tote, you are so creative! would there be a way for you to bring one to the party? I HAVE to have one of these...I'd use it all the time-I'll bring cash-is that cool?